There are lots of tasks which follow an amazing holiday; unpacking and laundry are usually chief amongst these. One which is less rare is updating your LinkedIn profile, which is exactly what I felt I needed to do following my recent visit to St. Thomas in the US Virgin Islands. David and I were visiting St. Thomas as the middle port of our seven-day Celebrity Cruise holiday on the Equinox. 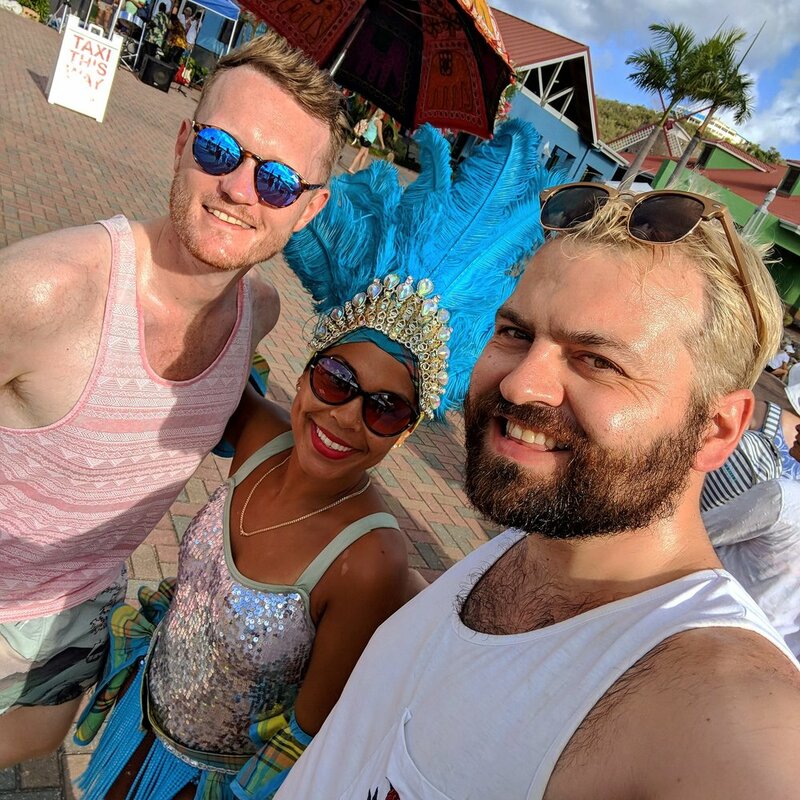 We had already visited San Juan in Puerto Rico and trekked a rainforest at nightfall, and our morning in Charlotte Amalie saw us taking an underwater adventure, so whilst cruises are generally relaxing, we'd certainly earned our drink in city. Maybe it was subliminal messaging? Fittingly, Charlotte Amalie, the US Virgin Islands' capital and the biggest city in the island chain, was founded as Taphus in 1666 - literally as a reference to a dwelling that serves alcohol. It was later renamed after the Queen of Denmark-Norway (and potentially to clean up the image of the city which was reportedly a haven for Blackbeard, along with many other of his kind). Whilst totally not debauched in the ways of the pirates which may have frequented the island, Bones, the rum bar we visited whilst ashore, definitely wears its pirate influence on its sleeve (flag?) and was a highlight of our trip to the island, if not the whole Caribbean, with the great drinks, friendly chat and the tale we have to tell from our visit. We first heard about Bones with David's pre-trip research, and were further reminded on leaving the ship and the bar advertising on the back of the handy map given out at port. We had an all-inclusive drinks plan with Celebrity, but always recognise the importance of spending money in the towns and cities around the ports we visit to ensure the benefit of tourism, particularly after 2017's dreadful hurricane season, can be spread wider. In Charlotte Amalie we planned to grab a few drinks and head to the city's Pirate Treasure Museum. On approaching Bones, after leaving the lovely steeldrum music of the main square and walking a little down the road, we initially thought we were in the wrong place. From the outside looking in, it looked more like a clothing store than a bar, but nonetheless we decided to go in and take a look around. The bar sells its own merchandise (hot sauce, pet leashes, tank tops, tees, flags and fridge magnets along with countless other things you could think of) all emblazoned with their Jolly Roger logo. Towards the back of the room is a long wooden bar staffed by the bartender with five bottles on top, each one filled with one of the varieties that Bones bottles and makes in the Virgin Islands, including Aged, White and Spiced. Behind the bartender were iced-slushy machines and lots of branded plastic cups in taster and full sized variants. Bones's deal is that you enjoy no-obligation samples of their varieties in the taster cups, and then choose an iced flavour (Mango Daiquiri, Strawberry Daiquiri and Painkiller - orange, coconut and pineapple - were all on tap during our visit). You're then free to load your iced beverage with as big a pour as you'd like (and keep topping it up). You pay just for this. Rum in the Caribbean, as it is locally produced and so plentiful, is cheap enough that this way of serving can still turn a profit for the company. David and I spent some time enjoying the different flavours of rum making Painkillers and Mango Daiquiris mainly. We also enjoyed speaking with the member of staff manning the bar who told us lots about the island, the rum and how the bar, and the store had been impacted by Irma and Maria the year prior (Bones was 'lucky' in that most of the damage from rising tides due to its marina locale). Shortly after our first drink, the bartender asked us if we minded keeping an eye on the bar as she needed to pop out for a spell. We figured, as the bar did not have a visible restroom or staff area, that she was going to use the facilities somewhere close. This wasn't the case and suddenly David and I were the managers of a rum bar for almost half an hour with us giving the bar's history, tasting notes and pouring drinks for the two couples who joined us at the bar during her absence. As I said at the start, it was definitely an experience, and worth adding to the old career history should the day job ever get too much and I need a job tending bar. It's fair to say that David and I were bowled over by the quality of the drinks and the hospitality of the place and wanted to take a little piece of Bones home with us. 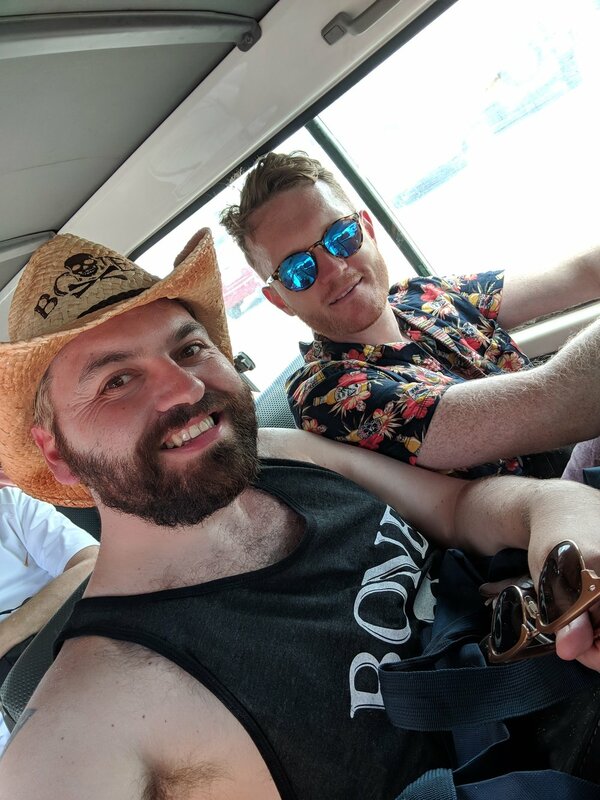 Whilst luggage allowance, and our always present fear of luggage handlers none-too-gentle hands, prevented us from picking up a bottle of the rum, we did leave with plenty including a fridge magnet, cowboy hat and his and his tank tops. After a few drinks and some great chats with the people with us about life our respective ships (it did seem like we were modern pirates coming ashore for grog), David and I made our way to the pirate museum to continue the day's themed activities. The clothing from Bones became the next day's beach wear on Sint Maarten. 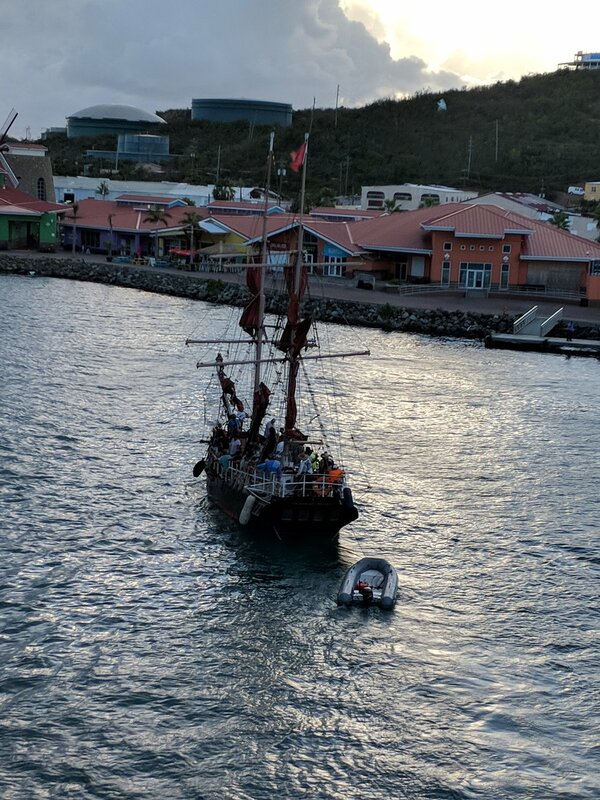 Once safely back onboard the Celebrity Equinox we were treated to a sail away featuring a pirate ship (and safety dinghy) and it really felt like a proper close to a fantastic Caribbean adventure. You can find out more about Bones in St Thomas, who have just begun to export their excellent spirits to the US mainland, by visiting their website at www.bonesrum.com and can similarly rest assure that David and I will be buying a bottle as soon as UK imports become available, or will be stopping by for a repeat shift behind the bar when next in the Caribbean.